When you completed training to become an electrician, you learned the ins and out of electrical leads. Misplacing one meant losing the ability to use devices. When you own or help run an electrical company, you must manage a different type of lead—electrical business leads. One of the most difficult parts of making a sale is acquiring a lead. 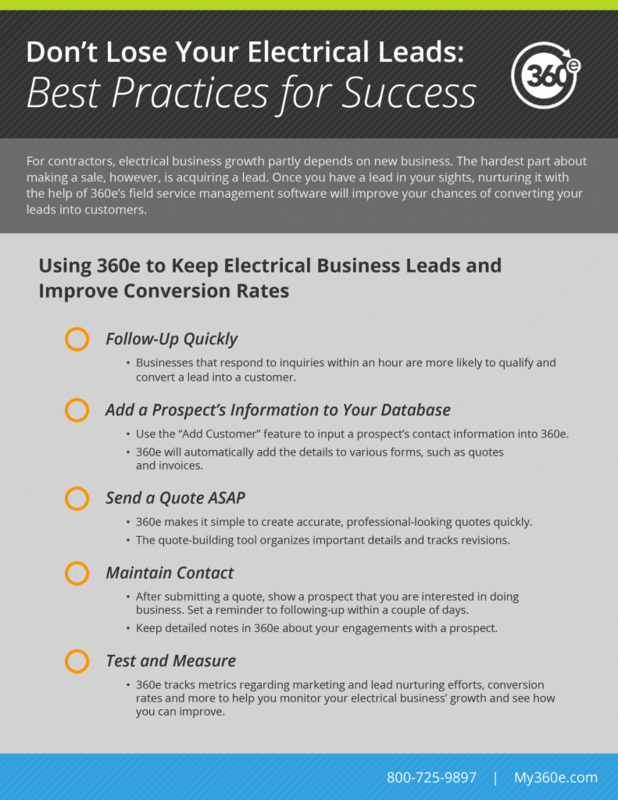 Once you have a lead, your electrical business growth depends on nurturing the prospect to convert them into a sale. 360e simplifies managing your business’ leads, allowing you to make a great first impression from the moment an individual shows interest. Download our checklist that summarize these tips for you. Developed specifically for contractors, 360e is intuitive all-in-one software that helps you manage every aspect of your business—from creating an estimate to sending invoices. The simple-to-use, web-based program works on almost any internet-connected device, so can you provide excellent customer service wherever you are. Take lead nurturing levels to a new level with 360e’s Sales & Customer Management tools, which provide you with a robust, efficient platform for managing your operation’s CRM activities. 360e allows you to manage sales cycles seamlessly, so you can focus on developing customer relationships without skipping a beat throughout the job conversion process. Follow-up quickly: One of the most critical components of converting a lead is following up in a timely manner. Harvard Business Review reports that businesses that followed-up with online inquiries within an hour are seven times more likely to properly qualify that lead than those that followed-up just 60 minutes later. The longer you wait, the more time a prospect has to contact a different company.Just as timing is crucial with online inquiries, so is returning phone calls and emails from prospective customers. Return a prospect’s call or respond to her communication as soon as possible. If you or the prospect are not immediately available, set up a reminder for yourself to reach out again at a more appropriate time. Add a prospective customer’s information to your database: When a prospective customer seeks a quote, enter his contact information in 360e using the “Add Customer” feature. Once you enter the information, the program will add it to the relevant forms throughout the conversion and sales processes, such as quotes and invoices, eliminating the need for double and triple entries. Send a quote ASAP: Creating and submitting a fair, accurate quote in a timely manner may seem like a daunting task, especially when you have a busy day. 360e makes creating accurate estimates simple and hassle-free. Simply use the quote building tool to make and submit professional-looking bids, while organizing important details, such as permit requirements. When a prospect wants to make a change, it’s no problem. 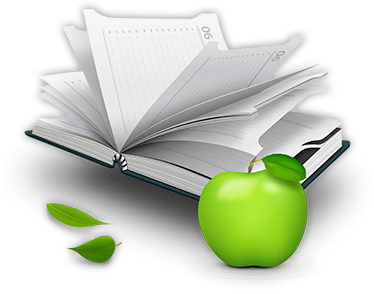 360e allows you to make and manage multiple quote revisions, as well as track each version. Maintain contact: Don’t leave a prospect hanging after submitting a quote. In general, customers that are ready to spend money will do so with the contractor that stayed in touch. After submitting a quote, use 360e to set up reminders to contact a lead within a couple days. If the prospect states that he needs more time to make a decision, create a reminder to contact him again within a week. Similarly, if a prospect stated that he’d call you by a certain date, set up a reminder to make contact with him if you don’t hear back. 360e allows you to keep track of conversations and follow-up action items easily to keep you on top of the game. When a prospect wants to move forward with a project, simply convert a quote to a job by clicking on the “Convert to Job” link in 360e. Test and measure: Regularly test and measure your lead nurturing process to identify areas of improvement. 360e’s reporting system allows you to track metrics regarding marketing campaigns, the number of leads received in a period, how long it took to respond to a lead, the percentage of leads that requested a quote, lead conversion rates, job-to-quote ratios and more. 360e’s Sales & Customer Management tools make it simple to maintain an up-to-date database that keeps information about your leads in one place, as well as notes about their respective stage within the sales funnel. 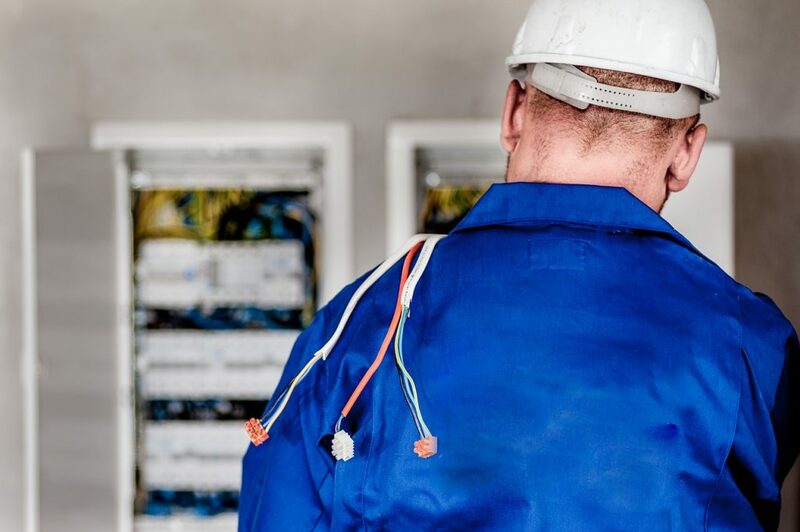 See how the program can help you boost your electrical business growth for yourself by scheduling a complimentary demonstration.